Curiously enough, on Flickr I see only people taking pictures of this kind of “objects” that are around me in Canada. As if you can find them only in Canada (and probably USA). But of course you can find them in different places. I’ve tried in Holland, but no luck. They clean up the old stuff too quickly. Small country we’ll say, they need the space. In Ukraine I had more luck. Like I already told here, Dubinka is a small village in the North-East of Ukraine. It is also an old village where many things are still as they were 80 years ago. 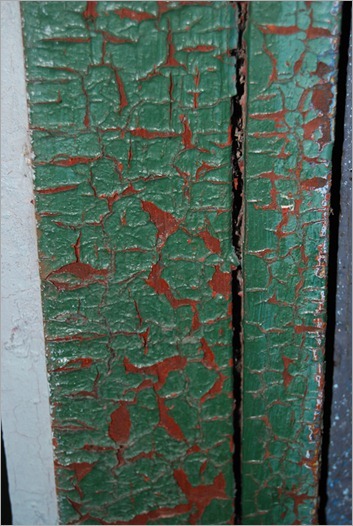 For old paint, no need to go into broken houses, this is the paint as it is on the front door of the house where I stay when I go there. It is also the only outside door of that house. Fully functional, and the type of color mix is also sold as new paint (in France). You put one layer, do not wait until it is dry, and put a second special layer on top of it, the two types of paint can’t stand each other and you get this effect. Without the paint chips. Believe me, I saw it. 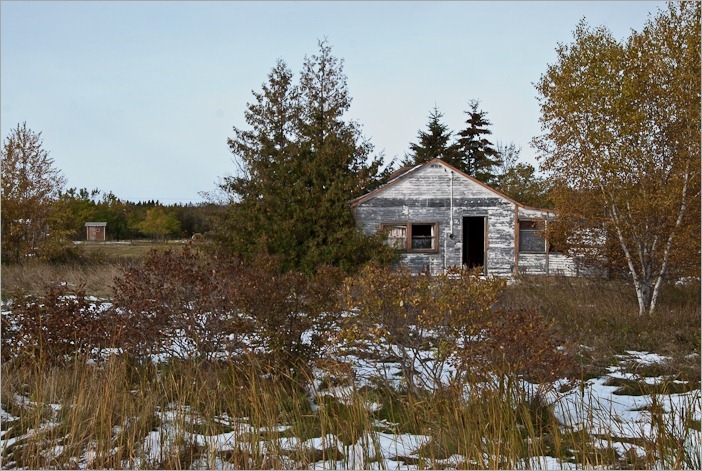 In Manitoba we have our share of abandoned houses and barns. But what about Ukraine here? Obviously they should have a lot of those too. However, Ukraine is not a rich country and building material is scarce. 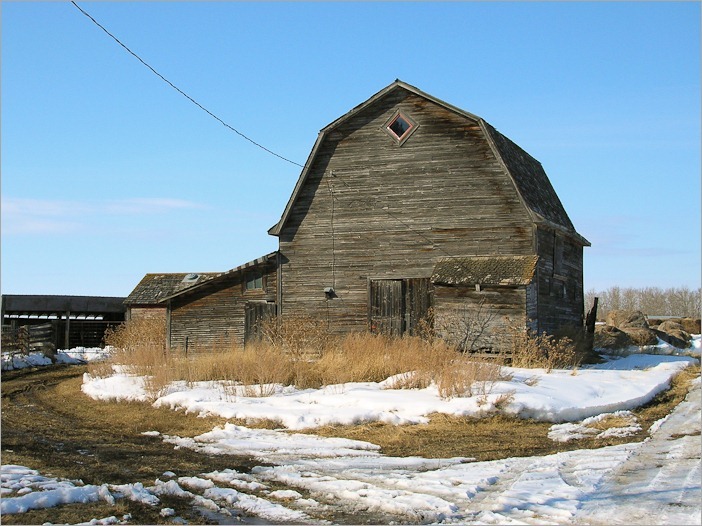 Therefore buildings, like the one pictured above, are mostly broken down and the wood reused. 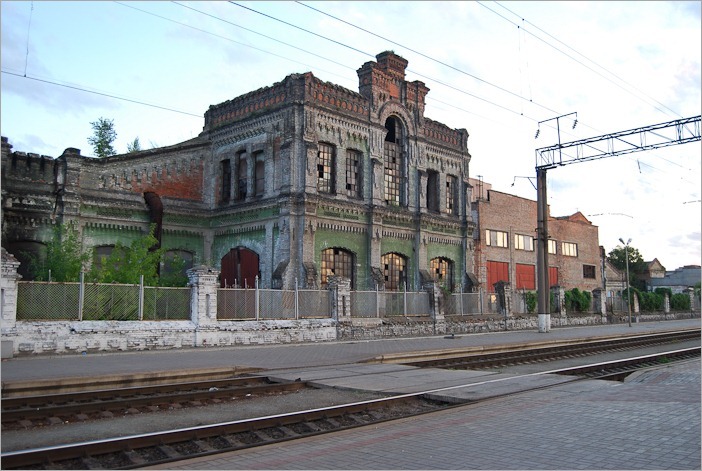 Ehm, yes, well you don’t come across this building occasionally, it is the railway renovation building for electrical coaches of the National Railways in Ukraine. Since this building was built in the beginning of 1950, absolutely nothing has been done to keep it alive. When it was built, one of the high numbers in the Soviet Union came here for a day, everything looked wonderful. After that, interest in keeping it in shape was lost. The result is what we see every day when taking a train. The building is still in use. Well, in Canada we can have railway bridges, disused, but forbidden for everybody. 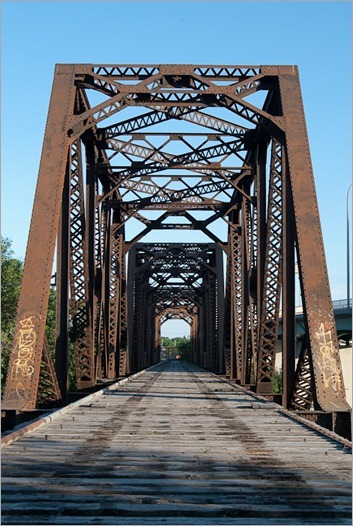 I believe there have been plans to create apartments on this bridge in Winnipeg. To me it looks more like the “Eastwood Ravine” where Marty McFly needed to speed his Delorean at 88 miles per hour. See the “Back to the Future” trilogy for this. Then of course there is the disused household material. A lot more common in Ukraine than I have seen in Manitoba. Although some of the stuff seems old and broken, it can still be used. 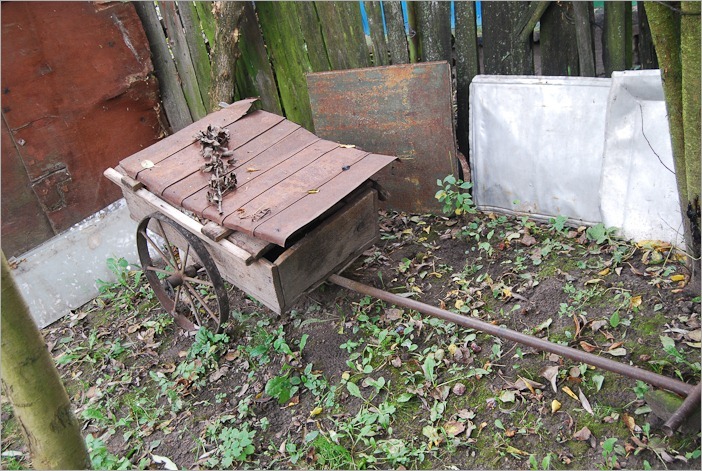 Made out of reused pieces, this cart is still in use, well, sometimes. Always better to transport your 50kg bags of home-grown potatoes on this cart than on your back. 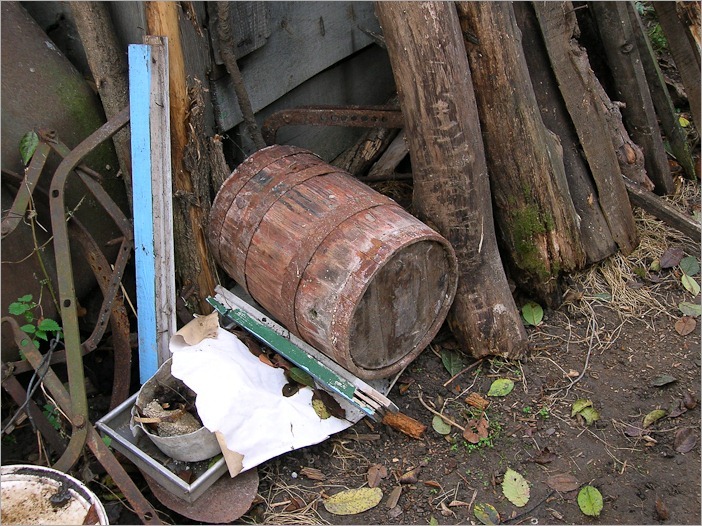 A little barrel, now unusable, but would still be able to do good services in a garden. A little sandpaper, a little varnish and good for another decade or two of service! And then there is the material that you don’t even believe to be in function at all. But coming closer to this transformer, the 50Hz hum (50, not 60Hz) warns you that the thing is really live. It provides electricity for all the village of Dubinka. 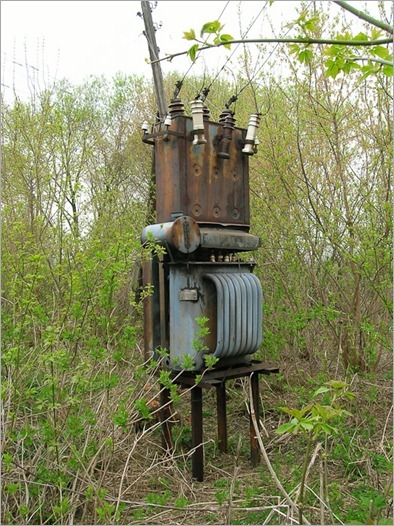 Once this transformer was struck by lightning. The village was in the dark, but the next day the (Manitoba Hydro) Electricity services were there to repair the thing. And then there are the materials that will go into a second life, no matter how old and moth-eaten they are. 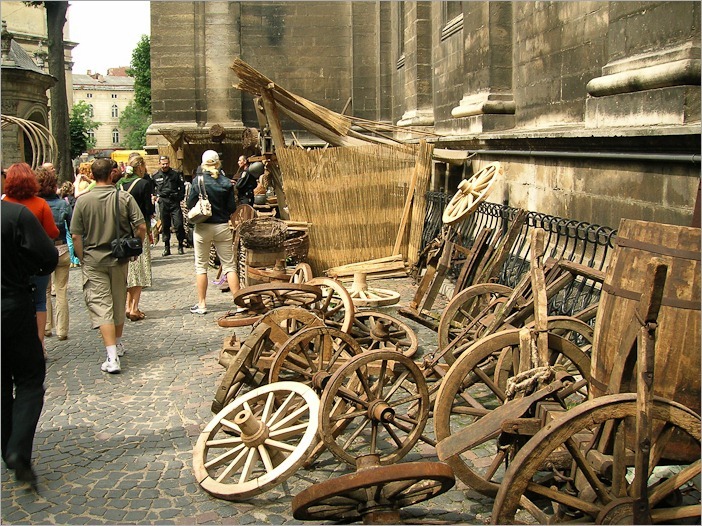 Here in L’viv in western Ukraine they renovate all these wheels. All of them are to be used in films. Not bad for your old day. So, when I feel old and broken (mostly broken, I’m not that old) I look at these pictures and say to myself : “Self, you’re not that broken, there is worse…”. Sometimes it helps, sometimes I just go back to sleep.